Pot seeding of all greens took place on September 10th – 12th. 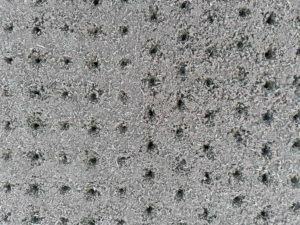 160kg (17 grammes/m2) of Bar Fescue seed was broadcast over the open tine holes created by our versatile SL6 Wiedenmann machine with solid 16mm tines set into the turf about 30 – 40mm deep. A heavy sanding of around 15 tonnes in total went on first and when it had dried enough it was all drag matted back into the tine holes. Further brushing and rolling took place to help fill up the holes and restore the greens for play.  The benefits of introducing Fescue seed into our greens are that it is firstly a perennial fine leaved grass native to links environments. It is a hardy grass as it is deep rooting and requires less water and fertiliser to keep it happy as oppose to Meadow grass (Poa annua) Ultimately the fineness of leaf offers less resistance to the golf ball and a better all round / year round putting surface. If we can achieve some success from over seeding it would be great to achieve a blend of Fescues / Bent grasses and Poa reptans. The reasons for doing this kind of work just now and not in October is that it will turn noticeably colder then and that would result a very poor strike rate. With a warmer soil as we have now and some decent rain the greens recovery rate and seed germination success are much improved. Fingers crossed! 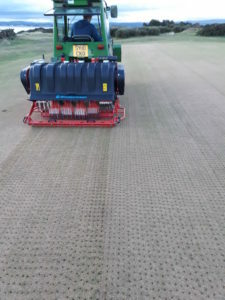 We have raised our height of cut to 4.5mm and are rolloing the greens on alternate days and this will give the new seedlings a chance to emerge. A week later we have sprayed the greens as a little coating and helper for the seed with some liquid seaweed, wetting agent and a little feed.